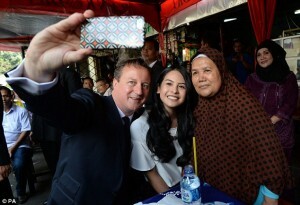 Dear Leader Cameron enjoying the local delights with Indonesian actress and singer Maudy Ayunda who was showing him around a street market in Jakarta, during recent visit to Asian countries..
Jennifer comments – On BBC Radio 4 this morning, one of family representatives said they are not yet convinced the flapperon is from MH370. James Naugtie tried to steamroller her into saying it was, but she resisted. If it was supposed to have crashed into a 4 mile deep area of the Indian Ocean, and it took 5 men to lift it, what kind of currents and forces were supposed to allow it to wash up on a beach? Kuala Lumpur – Prime Minister Datuk Seri Najib Razak confirms that debris found on La Reunion Island is indeed from missing Malaysian Airlines MH370. In a press conference held at 1.45am today, Najib said an international team of experts have conclusively confirmed this. Forgive my cynicism, has “plausible deniability” been achieved. Is this at a cost of just under £500 million ? – The Malaysian Anti-Corruption Commission (MACC) said it knew the identity of the donor who had banked in RM2.6 billion into Prime Minister Datuk Seri Najib Razak’s personal account. However, MACC said it cannot reveal the identity. In a statement, MACC said it will meet Najib to seek clarification on the matter. “MACC has received explanation from the donor who is from the Middle East, who has verified the donation made. However, the person’s identity cannot be revealed. “MACC obtained the donor’s details from bank documents and there were four letters submitted to the bank when the amount was banked into the Prime Minister’s account. 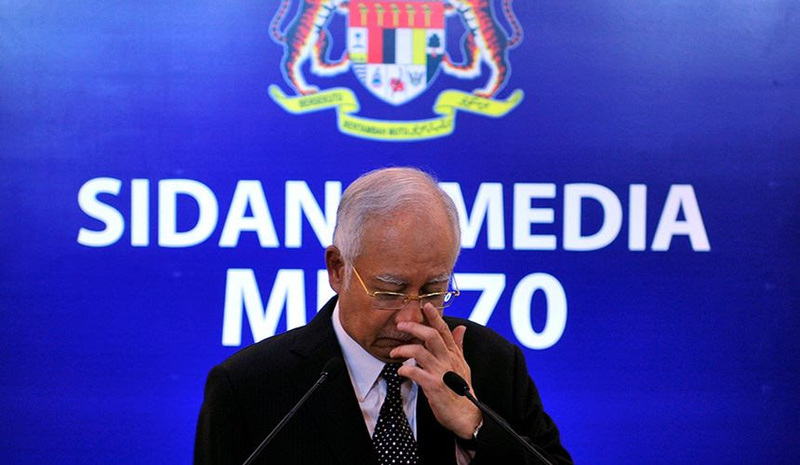 “In the documents, it was stated that the RM2.6 billion was deposited as donations. The MACC had on Aug 3 issued a statement that its investigation has shown that the RM2.6 billion reportedly deposited into Najib’s account was from a donor and not 1Malaysia Development Berhad (1MDB) funds, reports NST. Of course we don’t know whether Prime Minister Datuk Seri Najib Razak knew about the donation to his personal account, but you would expect your snake oil bank manager to give you a call asap and recommend a high interest account if a pile of money that size landed on your balance from afar. Only a week ago our own Beloved Dear Leader Cameron visited his Malaysian friends including the PM amidst much huffing and blowing about Malaysian corruption in the press. Prompting a media sound bite or two from Beloved Dear Leader Cameron who of course condemned corruption in all its forms. Presumably including receiving “donations” from mysterious middle eastern sources ahem. 2600000000 Malaysian Ringgit equals 428,458,784 British Pounds Some “donation” indeed. Makes you wonder doesn’t it.The Malaysian Airlines plane that has disappeared on a scheduled flight from Kuala Lumpur to Beijing is a 777-200ER from Boeing (BA). Dear Leader Cameron enjoying the local delights with Indonesian actress and singer Maudy Ayunda who was showing him around a street market in Jakarta. Kuala Lumpur – Prime Minister of the United Kingdom, David Cameron is undertaking a working visits Malaysia today as part of his four-nation visit to Southeast Asia. The Foreign Ministry in a statement tonight said Cameron is scheduled to hold a bilateral meeting with Prime Minister Datuk Seri Najib Razak whereby both leaders will hold discussion on various issues. “Both leaders will take stock of bilateral relations including in the areas of trade and investment, education and defence as well as cooperation within the framework of the Commonwealth and the United Nations. 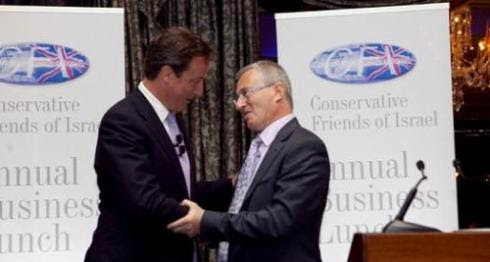 Cameron would be accompanied by Secretary of State for Business, Innovation and Skills, Sajid Javid, Minister of State for Trade and Investment, Lord Francis Maude, Minister for Small Business, Industry and Enterprise, Anna Soubry, Minister of State for Defence Procurement, Philip Dunne, and a 30-member business delegation, it added. Plausible deniability is the ability for persons (typically senior officials in a formal or informal chain of command) to deny knowledge of and responsibility for any damnable actions committed by others (usually subordinates in an organizational hierarchy) because of a lack of evidence that can confirm their participation, even if they were personally involved in or at least willfully ignorant of the actions. In the case that illegal or otherwise disreputable and unpopular activities become public, high-ranking officials may deny any awareness of such act in order to insulate themselves and shift blame onto the agents who carried out the acts, confident that their doubters will be unable to prove otherwise. The lack of evidence to the contrary ostensibly makes the denial plausible, that is, credible, although sometimes it merely makes it unactionable. The term typically implies forethought, such as intentionally setting up the conditions to plausibly avoid responsibility for one’s (future) actions or knowledge. In some organizations, legal doctrines such as command responsibility exist to hold major parties responsible for the actions of subordinates involved in heinous acts and nullify any legal protection that their denial of involvement would carry. On BBC Radio 4 this morning, one of family representatives said they are not yet convinced the flapperon is from MH370. James Naugtie tried to steamroller her into saying it was, but she resisted. I heard James Naugtie on BBC R4 this morning too… what a complete and utter waste of tax payer money this presstitute is. No real and proper journalism, simply lazy assumption. Of course, James Naugtie presents book programmes and listens to classical music, so he really is very clever and above criticism of mere members of the audience such as I! Everyday this twerp is the same, they all are, useless. Gatekeepers. The lot of them. I assume these gatekeepers are all fully aware of the deception they pull on the public every day at BBC R4. propaganda they spread. I doubt it but I suppose it’s possible. I wonder how many of these gatekeepers are assets of the ‘security’ services. Some of the shite they expect the public to swallow is obscene. I’d be crapping myself if I worked for the BBC in one of these cozy positions. People are waking up. Jonh Humphries sometimes has a note of such weary cynicism in his voice that I’m sure he knows the score but has to play along. But the noxious, odious, Sarah Montague is so flagrantly onside the Agenda she is vomitous to hear – so I only listen to her so as to register her egregiousness. She’s got quite a back catalogue. At one time every newspaper and all major police stations had an ‘asset’. Much easier to control or block the narrative at source. Crowd sourced news shared via the Internet has undermined this, hence the government’s use of disinformation and the intention to limit public access to certain Internet sites. The Prime Minister’s fairly recent speech to the UN, where he described people who doubted the veracity of governments’ accounts of events such as 7/7 and 9/11 as being as dangerous as ISIS; this alone tells us how concerned they are about their inability to control the story. Well spotted – hope Tap will follow this up. Tptb will pay huge bribes to the people they need on side. Then a few years layer go after them and the money comes back. Once they have served their purpose they will turn up dead. Seen this too many times. Meanwhile the people get sicker and poorer. Food banks in 2015 well now we know why. everyone one of a planes million parts have embedded in them a unique identifier. not one of these was found and delcared on 911, and neither will be for this farce. JimStone nailed this about a week after MH370 vanished.He published a cell-phone photo & text message from one of the passengers.It was sent to 4chan for reasons he explained.The location of the message’s origin was the US base on Diego Garcia.If you want to get to his site you have to enter 82.221.129.208 into your browser window. So the location of both the plane & passengers has been long known,but it’s not known what happened to either. The radar at Diego Garica will reach as far as Australia. The Aussie govt complained about that fact and DG had to reduce it. didn’t have the Malysian plane on radar. Source is a friend that served on DG. Plausible deniability is a cop-out that only those who are above the law THEY CREATED for us slaves! There are far worse things that Cameron should be tossed in jail, stoned and lynched by the people! he is a murder, like his fake “queen” german nazi ashkeNAZI jew, who is nothing but an imposter, from the tribe of satan’s synagogue, and Cameron and all of their real terrorist’s and criminals in positions of authority, hiding like cowards while they destroy the people, the land and the seas! The story on Cameron should always be his and his kinds pedophilia! Regardless of the fact they created abogus and sick law to protect these real terrorist’s and criminals. hey cameron, we the people know you and your kind, including mossad-cia-MI5 and 6 are the real terrorist’s and your queen is a monster! As for the PAYOUT to say the wing is from MH370, did we expect them not to continue to back up their lies, murdering rampage and false flags! hey cameron, tell your masters, the rothschilds, warburgs, von duyn’s, etc that WE THE PEOPLE KNOW THEY ARE BEHIND THE MURDERING OF MANY IN TWO PLANE “CRASHES”, of recent, but also so many more in the past, just because you fool the gullible and brainwashed, doesn’t mean we are all retarded like the red-jews of satan’s synagogue! The question tormenting millions of cyber-sleuths is Why? What could be the motive behind the elaborate plan for the midair capture of Malaysian Airlines flight 370?